Interview with the artists - Delta N.A. 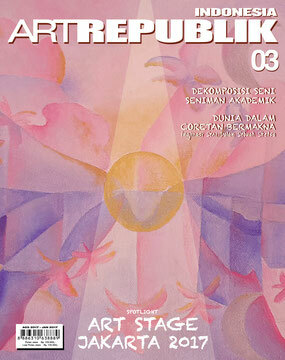 Art Republik Indonesia Issue 3. On the cover: "The way of the heart" by DELTA N.A. from Italia collaborated in art. Running into and falling in love with each other 9 years ago, Alessandro Vignola and Neva Epoque were university students majoring in psychology interested in visual arts. Both later agreed to live a life as artists once they reaped positive reviews from their audience. Under the nickname “Delta NA”, they opened an art studio in the heart of Asti, north Italian city with a magnificent mountainous landscape. To Art Republik, these two artists talked in length on their artistic journey to date. AR: How did it all begin? We learned pyschology on the same campus. We ran into each other while we were students at the same university. After graduation, we never met. After seven years passing, we met again at the same place the time we last met. 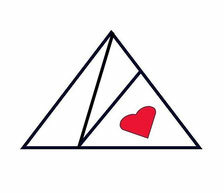 We believe in destiny, which is why we chose the name “delta” (destiny) to represent both of us in our artistic pursuits. Back then we painted on our own yet one day our painting collector wanted us to work on a larger-sized painting. As one of us had no enough time to work on such a project, we decided to work on it together. Our first collaboration painting was far from satisfactory. As the time went by, we learned that it was intriguing and ever since we have always painted in collaboration. In our collaboration, we required much time to discover our new style because this one should be different from our own styles. This should be novel and dissimilar from one we had as a solo painter. AR: Blue color dominates your works. Is it a deliberate choice? We experimented with relaxing and harmonious colors. We didn’t plan this and the process occured naturally. It is interesting as to there is no clue why our paintings show certain flows of color, from blue, green, pink, red, like repeated waves. We have no idea the exact reason but perhaps because it is related to emotions and feelings we have in certain moments. There may be possibilties that it is related to life rhythm, from slumber, daily routines to slumber. black is avoided because it blocks light and disrupts harmony of our paintings. Even for our signatures, we prefer using old blue, which we think looks more natural. you both think the best? It is hard to choose. But our latest painting usually is one we like most because we have the strongest emotional connection with it. AR: How is your creative process? Usually we start with a lot of drawing. Once we’re done with it, we proceed to the next phase by applying some paint. As we begin, we have no idea what it will eventually become but we keep on working on it. We can feel there is more to explore from there. Like a chunk of marble in front of us, and we are certain that there is a hidden statue in it. And what we can do is keep on sculpting it carefully. AR: What style or school of art do you adopt in these art works? It’s hard to decide which. You may call it abstract but it is not entirely so. There is some nuance of expressionism but it is not completely that. In the beginning, we call it “instinctive expressionism” as we use our fingers to paint. We choose to refer to it as “existential mechanics”, which serves as the foundation of our collaborative work process. We combine the informal abstract style in our painting process, we think as little as possible while working so as to allow the sensation of openness and relaxation in the mind of our audience.We also allow audience to interpret our works according to their personal understanding. AR: In the collaboration, there is always risks of overdomination over the other. If this occurs, what must be done about it? he most important thing is make sure the collaboration occurs in balance and how we find the right person to make us feel comfortable to be a partner. The process may take a long time to enable harmony and synchronicity. If one party dominates the other,the dominated one must reveal him/herself more in an art work. AR: Is there any particular reason why you paint with a small canvas? We don’t decide the size of canvas we use. While working, we have no idea what will come up on it. We just feel inclination towards a certain size of canvas. So this is not merely our conscious choice. It is safe to say a canvas chooses us. Therefore, every painting is born with its own meaning, size and colors. AR: Is there any message you wish to convey through your art works? We have a lot of messages in our artworks. In the recent years, we apply existential mechanics theory, stating that artists have their way of capturing reality behind the apparent world. Reality can be interpreted as a series of layers which overlap, resembling repeated patterns of fabrics. We start from geometric and static shapes and afterwards move to the universe made of these geometric shapes. Our message is that reality is like dreams. And reality is not only things we can see with eyes but it is something larger. This is how we combine a real life and spiritual energy. We encourage audience to enjoy our paintings gradually, not only once and leave as behind a painting there is a lot of meaning to dig in. A painting is also like a life, which always gives us surprises in condition that we are willing to open our mind to various new possibilities.